Whether the impact of artificial intelligence on global employment will be positive or negative is up for debate. Elon Musk, CEO of car maker Tesla, has warned it could destroy humanity, while others calmly point to how the workforce evolved after the industrial revolution. It is, however, universally accepted that AI is going to bring profound change to most areas of the world economy, the legal profession included. 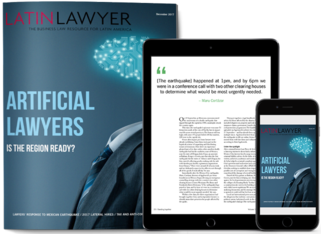 International law firms with large resources are already investing in AI, in a bid to achieve a competitive advantage. Latin Lawyer and law firm consultant Adam Smith Esq. set out to find out if, and how, Latin American law firms are using AI, through a survey of the region’s leading players, the Latin Lawyer Elite. Most recognise the power that AI yields, but are yet to make significant investments. In part, that’s because the software currently available is not suited to the region’s legal markets, but the entrepreneurial among them are taking steps to ensure they can move quickly when the time is right. As 2017 concludes, we chart the lateral hiring trends around the region in our annual review. From the Argentine firms jostling for talent as the economy opens up, to the UK firms stepping up their regional footprint, we collate the top people moves of the year. We also take a moment to reflect on the unified, fast-moving response of Mexican lawyers after the country’s recent earthquake. Three pro bono clearing houses came together and made use of the media to reach those in need of assistance fast. Also in this issue, we hear how Paraguay has passed a law eliminating bearer shares, which will bring the country in line with others in the region and make money laundering harder. Latin Lawyer also reports on its recent anti-corruption and tax conferences.